Mason Williams ("Classical Gas"), and Andrew York (Los Angeles Guitar Quartet), as well as Richard Watson , harp-guitarists John Doan and Beppe Gambetta , Brazilian jazz master Peter Sprague , and Grand Old Opry star Doyle Dykes . The program debuted to enthusiastic sold-out audiences at the lavishly renovated, palatial Birch North Park Theatre. Primal Twang was the brainchild of flatpicking pioneer and Taylor Guitars artist, Dan Crary and writer/producer/director Anthony Leigh Adams. The duo wrote a script that begins with the guitar's ancient ancestors and covers not only the wildly eclectic forms of music played throughout the centuries on variants of the steel-string, nylon-string, and electric guitar, but also the sociological impact the guitar has had in every era. 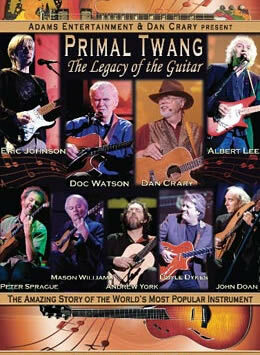 Primal Twang reveals compelling stories and music from the guitar's past, present, and future. Dan and the seven-piece band perform everything from ancient modal music to classical, flamenco, and the Chet Atkins school, and from the guitar-based vocal pop of the early 20th Century through the jazz, folk, and rock eras, right up to today. At key points in the show, featured guest artists join the band, and the viewer gets to see and hear some of the best guitarists in the world as the "instrument of the gods" emerges from antiquity, gathers steam over centuries, and explodes in our own time to become the "universal" musical instrument. Crary, a world-traveler, raconteur, and former communications professor, starred as the singer/narrator, accompanied by a stellar stage ensemble including music director and multi-instrumental, Dennis Caplinger (HBO's Deadwood ), drummer Duncan Moore , classical/flamenco guitarists Fred Benedetti and George Svoboda (who performed with rising flamenco dance star Lakshmi Basile ), gypsy-jazz guitarist Raul Reynoso , bassist Jeff Pekarek , and pop-rock guitarist/vocalist Jon Walmsley ("Jason" on the TV series, The Waltons , and now an in-demand session player in Los Angeles). © 2008 Buzz Feiten Design, Inc. All rights reserved.